Air Mauritius’ largest markets were hit hard by the European debt crisis, resulting in a loss in its usually profitable second quarter. 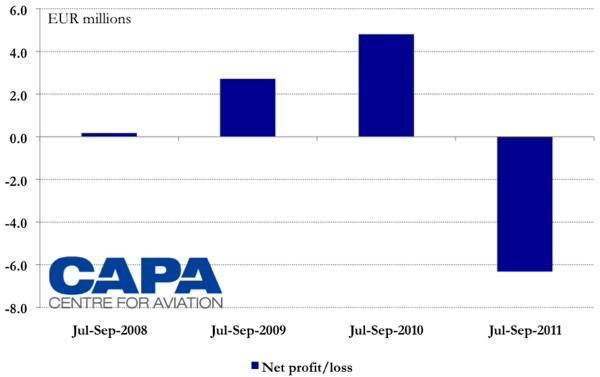 The airline reported a net loss in 2QFY2012 of EUR6.3 million, compared to a nearly EUR5 million profit in the same period last year. The European debt crisis that hit Mauritius’ largest markets contributed to the loss and has set the carrier up for future challenges. While Mauritius reported a small increase in tourism arrivals for Oct-2011, thanks to a new air link with China that increased Chinese tourism arrivals by 161%, tourism overall is expected to fall, placing further pressure on the carrier. 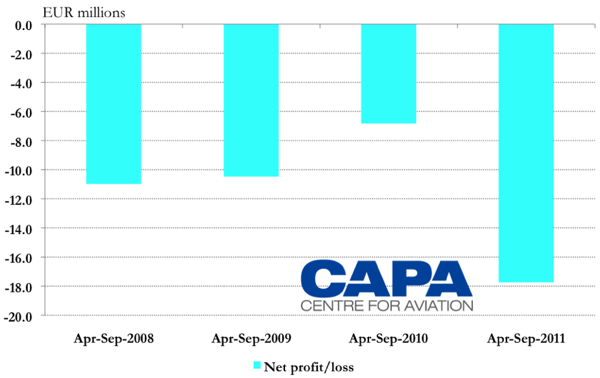 Air Mauritius’ net loss for 2QFY2012 follows a net profit of EUR4.8 million in 2QFY2011 and a EUR2.7 million profit in 2QFY2010. The deteriorating results were driven by the European debt crisis that is occurring in the carrier’s largest markets of France, the UK and Italy. Ticket sales slumped as consumer confidence in these markets took a hit, leading to an increasing number of travellers postponing or cancelling their travel and leisure plans. The carrier’s high dependence on these markets, coupled with the ongoing issue of rising fuel costs and the volatility of currency exchange rates, led to its significant loss in the period. Air Mauritius reported a 45% increase in fuel costs for the quarter and a 14.8% increase in overall costs. For 1HFY2012, the carrier spent EUR24.8 million on fuel, which is constantly blamed as one of the carrier’s largest hurdles to overcome. Due to the conditions in the second quarter, Air Mauritius reported a loss of EUR17.7 million in 1HFY2012. This loss is considerably higher than the EUR6.8 million net loss posted in the same period last year. The carrier’s path to recovery, which was seen in 1HFY2011 through a smaller loss, has been hindered by its recent weak performance. In anticipation of the economic slowdown, Air Mauritius attempted to shift its focus away from its European markets and increase frequencies to emerging markets such as China, India, South Africa and Australia. 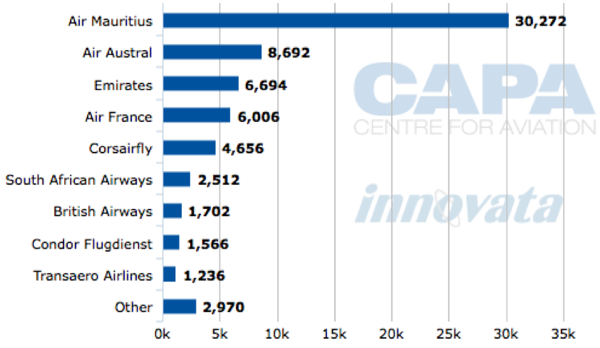 The carrier added more than 35,000 seats to these markets in 1QFY2012 compared to 2QFY2011, which saw its total passenger traffic rise 4.4% to 336,391 in the period. The launch of its weekly Kuala Lumpur-Shanghai Pudong service helped boost passenger numbers, and at the same time is responsible for the 161% surge in Chinese arrivals to Mauritius in Oct-2011. Air Mauritius hopes to launch the service as a non-stop route in Feb-2012 and increase to twice weekly in Oct-2012, if demand persists. While the carrier’s shift to emerging markets is showing some benefit, it is not enough to make up for the shortcomings in the European market. In Sep-2011, Mauritius reported an overall drop in visitor arrivals of 0.8%. Tourists from Europe and Africa fell 1.6% and 6.7%, respectively, which is an indication of the months to come. Arrivals from Asia increased 5.3% due to the carrier’s new focus on Asian routes. Air Mauritius’ share price remained steady over the past three months with the exception of 11-Nov-2011 when its financial results were released. 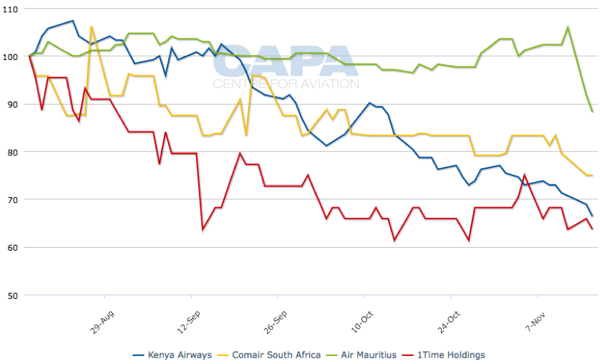 Before that, Air Mauritius’ shares remained the highest among Comair, Kenya Airways and 1time. Air Mauritius is embarking on a review of its business model in order to cope with the economic downturn and projected dip in financial and traffic results. This involves continuing its expansion into emerging markets to soften the impact of the inevitable drop in European demand. In addition to increasing its service to Shanghai, Air Mauritius is also planning to launch an extra weekly frequency on its Mumbai route in Mar-2012, which it currently serves three times weekly with A330-200 equipment. Trade relations between Mauritius and India have been improving steadily over the past years, with the country ranking as Mauritius’ second largest import partner and second largest trade partner overall. Trade between the two countries surged 13.5% from 2009 to 2010, to EUR5.6 billion for the year. Mauritius imported EUR5.5 billion worth of goods from India in 2010, an increase of 18.9% from 2009’s levels. Aside from the European Union, India is Mauritius’ fastest growing trade market. Malaysia has the potential to become a strong market for Mauritius considering the historical, cultural and tourism ties. Both countries were governed by both Dutch and British rulers and gained their independence in the second half of the twentieth century. In terms of populations, both countries have large communities of Chinese and Indian ethnic groups. Islam, Hinduism and Christianity are significant religions in both countries. Mauritius and Malaysia have a tax treaty agreement and a visa agreement – where Mauritian citizens are not required to obtain a visa to enter Malaysia and vice versa. Air Mauritius has been attempting to establish Kuala Lumpur International Airport as a hub for future expansion for some months now. 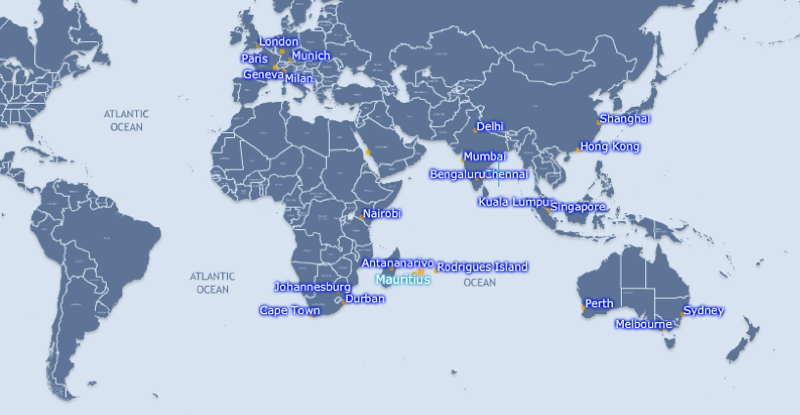 The carrier operates all its Asian services through Kuala Lumpur (excluding Hong Kong and Indian destinations), however, further progress in hub establishment has been slow. In the last quarter, only one new destination to Asia (Shanghai Pudong) was launched and the carrier has not announced plans to launch any additional or new services to the region that it hopes will save it from the European crisis. 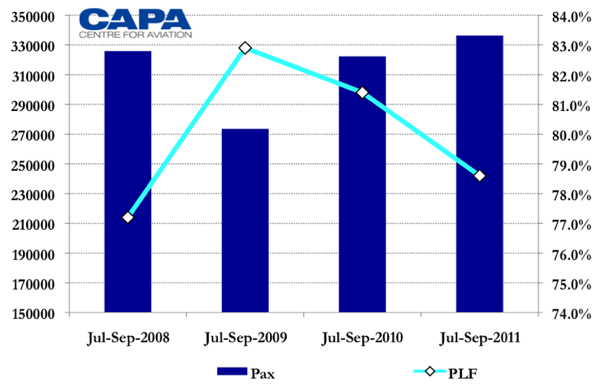 Expansion into Asia looks less likely now following the carrier’s decision to reduce service to Hong Kong in Nov/Dec-2011 from three times weekly to twice weekly. Another cog in the carrier’s new business plan is likely to include a renewed focus on quality tourism. Air Mauritius’ service to Shanghai Pudong, with A330-200 equipment, is configured with 24 lie-flat business class seats and 251 economy seats. It will bring in a few high-yielding tourists, however, more first and business class services are needed to counter the effects of low arrival numbers from Europe. Air Mauritius expects corporate travel to Mauritius to increase by 90% by the end of 2013 due to its impending efforts, which have not yet been officially announced. The carrier transported 1500 corporate travellers between Apr-2010 and Mar-2011, and expects this to increase by 38% to 2100 by Mar-2012, then to 4000 by Apr-2013. The carrier plans to increase its participation in the Vanilla Islands Tourism Group, and should consider increasing marketing efforts. Since Air Mauritius holds more than 50% of capacity in Mauritius, its success will directly impact the number of tourism arrivals. Tourism, of any nature, is the backbone of the Mauritian economy. The country’s labour force by occupation falls heavily into construction and industry occupations (30%) and the trade, restaurants and hotels sector (22%). The country has a middle-of-the-road youth unemployment rate of 21.4%. To bring that down even further, job creation through the tourism industry is crucial. Overall, the country’s unemployment rate is 7.8%. Mauritius Sir Seewoosagur Ramgoolam International Airport (Mauritius International Airport) receives a high capacity of business class travellers, yet an extremely small number of first class travellers. 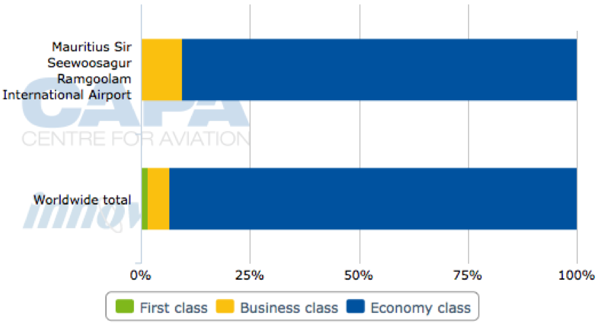 The airport’s first class capacity of 0.4% falls well short of the worldwide total of 1.7%. Other airports in the Vanilla Islands Tourism Group have high business and first class capacity, and collaboratively, the group aims to improve high-yield tourism. Air Mauritius believes the global downturn has “set in for the long term” and the reviewing of its business plan is the first step in trying to cope with this. While the review is a step in the right direction, its expansion into Asia has been occurring too slowly and the carrier should have started shifting its dependence from Europe well before 2008, instead of waiting until things worsened. Air Mauritius’ neighbour, Air Seychelles, has also launched a restructuring effort as it experiences a similar phenomenon from its European market. Mauritius’ national carrier expected to achieve an operating profit for the year’s end, however, this no longer looks to be the case. Fuel costs and volatile exchange rates will continue to plague the carrier. The next few quarters will be challenging for Air Mauritius with its results only improving in line with the European economy.